Setting combined.pdf as the destination. The -v option is for verbosity. 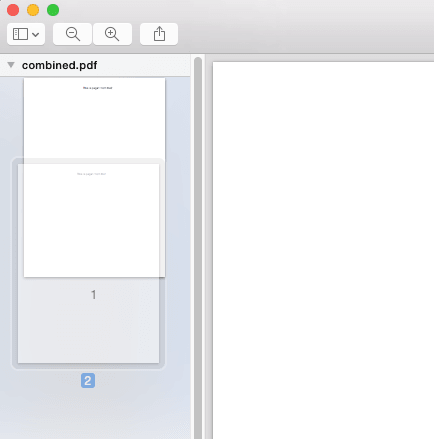 Mac preview can be used to view multiple pdf files and then export them to a single pdf file. These are the instructions to combine input1.pdf and input2.pdf. First copy one file (say input1.pdf) to combined.pdf. This way we can preserve the original files. Note that you can drag multiple thumbnails also. The changed file (combined.pdf) is automatically saved. In case you make a mistake, you can use the undo option in Edit menu.